On November 8, 2013, Typhoon Yolanda (international name: Haiyan), considered the most powerful storm to make landfall in recorded history, hit the Philippines. Yolanda affected 1,473,251 families, with a casualty count of more than 7,000 and took millions of pesos in properties and infrastructure. One year after the catastrophic event, we ask: Where are we now? In Tacloban, with the opening of grocery stores, the restoration of water supply, and the resumption of banking operations, the return to normalcy began. Survivors taking temporary shelter at the Tacloban Astrodome were supplied with tents, and more assets were deployed to assist the continuing relief efforts in the region. Relief poured in from all sectors in the weeks that followed the typhoon. Not just from within the country—the international community came to the aid of Filipinos affected by Typhoon Yolanda. As of November 5, 2014, Foreign Aid Transparency Hub (FAiTH) has reported that the total amount of foreign aid pledged is currently at P73,307,438,834.36 or $1,643,038,277.66. Access FAiTH online to view the breakdown of these funds. The Build Back Better principle of the government serves as the guiding framework in the development and implementation of post-Yolanda rehabilitation and recovery interventions. Building back better entails not just the simple restoration of communities, but fortifying them that they may be ready for future disasters. On January 10, 2014, DepEd reported a 91% student attendance rate in five affected areas (Samar, Leyte, Tacloban, Eastern Samar, and Ormoc City), with a 96% teacher attendance. As of February 2014, Project Nationwide Operational Assessment of Hazards (NOAH) has completed the high resolution 3D mapping of the topography of Tacloban City and its adjacent areas. 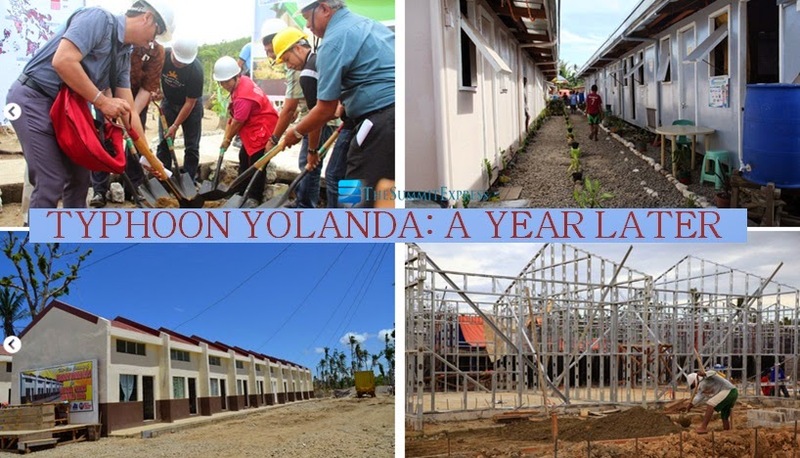 The DOST and the DENR jointly launched last May 17, 2014 the Yolanda Rehabilitation Scientific information Center (YoRInfoCenter), a one-stop shop for government agencies and private organizations that provides latest satellite images and high resolution hazard maps that can be used as reference in rehabilitation efforts. According to Project NOAH Executive Director Mahar Lagmay, a storm surge warning system should be ready by December 2014. As of March 2014, power supply has been restored in 155 out of 196 barangays in the municipalities of Palo, Babatngon, and Tacloban (115 out of 138 barangays in Tacloban City, 17 out of 33 barangays in Palo, and 23 out of 125 barangays in Babatngon). Based on the November 5, 2014 report, out of the target 8,629 housing units, 1,252 housing units have been completed. The rest (7,377) is estimated to be built by March 2015. To read more about Typhoon Yolanda comprehensive report, check out here.